Lady spills hot coffee on herself and then sues McDonalds for millions and wins. Remember that story? I certainly do. I thought it was a ridiculous claim and a perfect example of a frivolous lawsuit. So just based on that limited amount of knowledge I thought I’d give this documentary a try. Boy did I have my facts wrong. 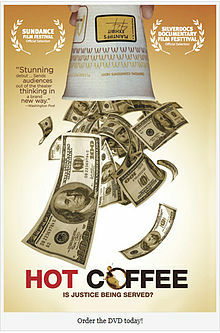 This excellent documentary uses the hot coffee case to highlight some very important issues. First off, I can tell you that most of what you think you know about the hot coffee case is probably wrong. This film sets the record straight. All you have to do is see the injuries suffered by the woman involved in this case and you will understand. Much of the film involves the notion of frivolous lawsuits, tort reform, arbitration clauses, and limited liability. Don’t let that description scare you away. This film is an eye opener. I’ll start with tort reform. Sounds pretty boring, right? Tort reform involves laws that limit damages. Sounds reasonable, right. We don’t want people going lawsuit crazy looking for a quick buck, right? So let’s pass laws that limit the amount that you can sue. President Bush was a big pusher of tort reform laws. There are very few things that George Bush did as president that I agreed with. But I agreed with him on this issue. And once again George Bush was on the wrong side of an issue. The fact is the only people who benefit from limited damages and limited liabilities are businesses and large corporations. The filmmakers highlight a number of cases that show how limiting damages can lead to injustice. One example involved a medical mistake that left one of two twins brain damaged. The amount of money the family was awarded in their malpractice lawsuit doesn’t come close to covering the cost of the care needed. The filmmakers also look at how corporations have taken the ability to sue away from ordinary people by putting in arbitration clauses, sometimes sneaking the clauses in after the fact. What are your chances of winning an arbitration? I don’t remember the number given in the film, but it was less than 10%. So let’s assume that you are injured in some way and you go to trial. The jurors agree with you and award you millions of dollars. Don’t start spending your money just yet. First off, the judge may simply reduce the award to the maximum allowed by law in that particular state. If that state adopted tort reform laws, you’re out of luck. Your ten million dollar award is now worth only $250,000, maybe less. It all depends on how successful guys like Carl Rove have been in buying politicians and appeal court judges. The stories told in this film are heartbreaking. I highly recommend that you add this one to your queue. It’s available on Netflix.